Over the years, I began giving hints on every post about the ingredients. This year, I’ve decided to move forward with my original vision, and cover an ingredient from (hopefully) every post with a goal of eventually having my site be a better resource for you. Today, obs, I am choosing beets, inspired by my recent posting of Cubby’s Beet & Goat Cheese Salad. I’m talking about the common beet, here, and culinary use of beets. Usually known in North America as the beet, and also known as the table beet, garden beet, red or golden beet, in other parts of the world you see it called beetroot. The common beet is one of several of the cultivated varieties of Beta vulgaris grown for their edible taproots and their leaves, which are called beet greens. Beets, along with chard, spinach, and quinoa belong to the chenopod family. While most of us are familiar with the garden beet, beets also come in different varieties and might be purple, pink, golden, white or candy-striped inside. Golden beets are said to be slightly sweeter than red beets, without as much of the “earthy” flavor of the common garden beet. The white is the least sweet and the candy-striped are among the sweetest. Fresh beets are available throughout the year, their season runs from June through October when the youngest, most tender beets are easiest to find, and that’s when you’re likely to find great prices for beets at farmer’s markets and better pricing at the grocer’s than you will through the winter and spring. Beets are sold in a bunch of two, three or four rather than priced by the pound. In the offseason, those bunches always are smaller and the price higher. Beets may have beautiful beet greens, scrappy ones or the greens may have been removed. The greens say it all when it comes to freshness, although ratty greens don’t necessarily reflect the quality of the beets. For the tastiest beets, look for medium-sized to smaller beets that are darkly colored, firm and smooth. Avoid beets with bruises, spots, shriveling, soft areas or other signs of spoilage. Beets are also available canned, whole or diced as well as frozen, and either can be a viable option at a much lower cost than most fresh beets. You’ll find beets pickled, too, which is a simple process easily done at home for pennies, and canned beets may be pickled, as well. Since beets are experiencing a hey-dey as a superfood, you’ll find beets dehydrated as chips and in a powder form and you’ll find beet juice and supplements at natural-food stores. To store, cut the greens off the beat at about 2″, so they don’t draw moisture and nutrients from the root end, leaving the excess to avoid excess bleeding. Do not wash the beets. Place beets in a plastic bag, pushing out as much air as possible and store in the refrigerator. The cold will slow excess loss of nutrients. Beets keep three to four weeks stored like this. Treat your beets gently; they look sturdy, but are quite delicate and bruising will cause excessive bleeding. The greens should be stored in a separate bag, unwashed until ready to use. Again, remove as much air as possible. They’ll keep for three to four days. If there are any ties or rubber bands on the greens, remove immediately. If the beets or greens form condensation after refrigeration, remove from the bag after they’re cold, turn the bag inside out and return the beets or greens to now dry inside bag. Freezing: Do not freeze beets when they’re raw; the texture will not be good, but after being cooked, beets freeze well. Pickling: Beets pickle easily and are easy to do. Pickle for refrigeration in small batches. Check out My Grandmother’s Refrigerator Pickled Beets or can in larger batches to store at room temperature using the water bath canning method. Canning: Canning beets (not the pickles) will require a pressure canner. Check Canning Beets from the National Center for Home Preservation. Beets can by dried or dehydrated at home. Again, the National Center for Home Preservation comes through with instructions for beets (and other vegetables) on a printable PDF. Gently rinse beets, being careful not to tear or bruise the skin, which will cause them to leak more of their liquid. Unless you are very careful, it’s very likely your hands and fingers will be stained while working with beets. Wear kitchen gloves, and if your hands are still stained rinse and dry immediately then rub with lemon juice. If possible for best flavor and least mess, leave the skin on the beet and the stem and root ends intact when cooking. Leaving the skin on and ends intact when cooking locks in the flavor and maintains the integrity of the cells which minimizes leakage. Beets peel very easily after they’re cooked. For less bleeding, remove the excess root end first, peel and then remove the stem end. When trimming the beet, either before or after cooking, slicing away just a bit extra from the stem and root end minimizes some of the “earthy” taste of beets that is offensive to some people. The common beet, like most root vegetables, responds well to several cooking methods. A favorite method is to roast, wrapped in foil and even the blander canned beets can be improved by drizzling with vinegarette and roasting; see both methods in Cubby’s Beet & Goat Cheese Salad. Beets can also be baked, boiled, or steamed as a side dish, and can be used raw, cooked or pickled in salads. The leaves and stems of the plants can be steamed, simmered or sauteed and treated much like Swiss Chard or they can be stir-fried. They may be eaten as a vegetable cooked or added raw to salads or smoothies, either beautiful, tasty ones or my very serious smoothies like my Big, Fat, Green Smoothies on a Budget. A lot of my potential food waste goes into those smoothies. According to Wikipedia, a 100-gram amount (about 3 1/2 ounces) beets supply 43 Calories, contain 88% water, 10% carbohydrates, about 2% protein and have a minute amount of fat. Beets are also a source of betaine, a type of antioxidant that’s evident in its rich, red-colored roots. The beetroot is also a notable source of manganese, folate, and vitamin B2, as well as a source of potassium. Beet greens are usually a valuable source of lutein/zeaxanthin. One cup of raw beet greens may contain over 275 micrograms of lutein! 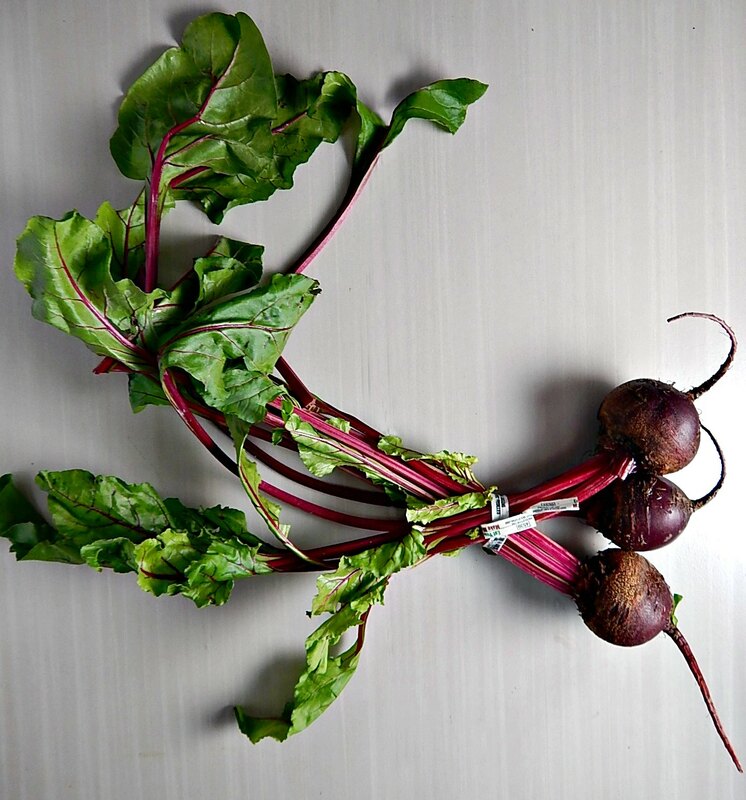 Beetroots are not nearly so concentrated in lutein, although some beetroots, like the roots of yellow beets, may be valuable sources of this carotenoid. If you’re interested in knowing more about beets, their nutrition and health benefits, including their role in detoxification, their antioxidant, and anti-inflammatory properties, check a reliable site, like the World’s Healthiest Foods. It’s where I get most of my nutritional information (and a lot of information for this post.) Myths and misinformation about the beet, especially since it’s sudden rise in popularity, are everywhere, some of them a little crazy! For instance, I saw a site that claimed the sugar in beets doesn’t affect the blood sugar in diabetics. Wrong. A side effect of beets, affecting 5 to 15 percent of the population is “beeturia” a condition that turns the urine pink or red. While not commonly a cause of concern in itself, in some cases it may point to individuals with iron deficiency, iron excess, or specific problems with iron metabolism. A follow up with your Doc may be indicated. If you have kidney disease, your Doc may direct you to avoid beets because of their high potassium content; elevated potassium levels may cause specific issues, including heart attack. Also, while beet allergies are rare, they do occur in some people. Symptoms of a beet allergy may include stomach cramps, diarrhea, vomiting, and hives. Anaphylactic reactions have also been reported. I hope you’ve enjoyed “What To Know About Beets.” I know I’ve only scratched the surface, but additional resources are listed below! In the meantime, if you can’t beet ’em, join em! (I couldn’t help myself!) If What To Know About Beets has you hungry for more, click on the tag, “beets” at the bottom of the page to see all recipes that reference the beet. I’ll be sharing What To Know About Beets at Fiesta Friday #261 co-hosted this week by Antonia @ Zoale.com and Julianna @ Foodie on Board. Stop by and visit Fiesta Friday and see what wonderful recipes have been posted this week. This entry was posted in Click here for Fabulous Food Posts and tagged Beets, canned beets, Ingredients, pickled beets. Bookmark the permalink. Wow, Mollie! You put a lot of work into this and it is now a wonderful resource for everyone! I am a huge fan of beets, so now when I eat them, I will do so with so much more knowledge behind me! Thanks so much for bringing this over to Fiesta Friday this week! I hope you have a wonderful week! Thanks much for hosting! I want to do more of these posts. I just get tired of not being able to find info on what I need for ingredients! What a lovely post. I love beets in every shape and form and use them in some variation ( roasted, boiled, fermented) once a week. Thank you for sharing all the wonderful facts Mollie! #1 THEY ARE GOOD! LOL! Give me a bowl of roasted beets, goat cheese & balsamic vinegar and I’m content. Beets are one of my all time favorite foods! But I’m always looking for more ways to prepare them… bookmarking! I think I’m finding my tribe of beet lovers! I was sure this wasn’t going to be one of my most popular posts, lol! Thanks for all the info on beets! They are so good for you–I need to eat more of them! They really are pretty amazing – and I think they have the right to be called a super food, and it’s not just all hype. That combination sounds wonderful!! Parsnips are another fave of mine!! I am tempted now myself and have 2 parsnips rolling around in my fridge drawer, not enough to do anything on their own but they’d be perfect for a roast like that so I am inspired back! Absolutely! I love it with bleu cheese and with goat cheese! Or even back in the days of the salad bar, with cottage cheese, lol!! Great post full of wonderful information! Thanks, Robin! I can’t wait to do more ingredient posts! Mollie, a great essay on the beet. Very informative and well researched. Here in Sweden betor (beets) are a huge part of our diet. Also, hear in Skåne we produce sugar beets which are processed into various sugar forms and supply most of Scandinavia. Thanks for pointing out the value of eating the leaves as they’re very tasty and nutritious. Now, your post has me wanting to make some beet cured salmon. I like your new ingredient approach. Thanks, Ron! Who knew there was so much to know about beets, lol!! Sugar beets are big in North Dakota, next door to us in MN, too. I have only heard of beet cured salmon, think maybe I saw a pic once but I would LOVE to see that recipe! It sounds divine! YUMMY…………I LOVE beets. 🙂 thank you for another great post. Thanks so much! I learned a few things writing this, too! Serendipity! I will be making a beet gratin casserole next week. I’ll let you know how it comes out. But it has bread crumbs and parmesan so I’m guessing it’s going to be pretty damn good. Excellent post as always. Beets have become one of my favorite vegetables over the past few years. I’m guessing it’s going to be effing delish!! I hope you’ll post it – but wait! I’ll already know what it is if you do! The cat’s out of the bag, lol!! I think of beets when I think of Russia, Poland, Czechoslovakia and Germany. I would have guessed that they might have been a part of your upbringing! Back in the day when I was a kid, all the restaurants had salad bars, my plate would be a smidge of lettuce and dressing and mostly pickled beets, lol! I don’t remember my mom ever serving them when I was growing up. We were from the former Yugoslavia, an area with a majority of Serbian and Romanian speaking people though my mom cooked Hungarian and German/Austrian dishes. It’s possible that my dad didn’t like them so they weren’t part of her repertoire. PS: As you know, I hated most vegetables, esp raw tomatoes, so I understand why they weren’t something I experimented with later in life. You would be my perfect dinner guest when I’m serving beets then. More for me, lol! !